Progress has been at a standstill while I’m acquiring the needed paint products. I picked up some por-15 for the frame and u-pol raptor liner has been on order for a few weeks. After Amazon bumped my delivery for third time I found another source and it should be here Friday. 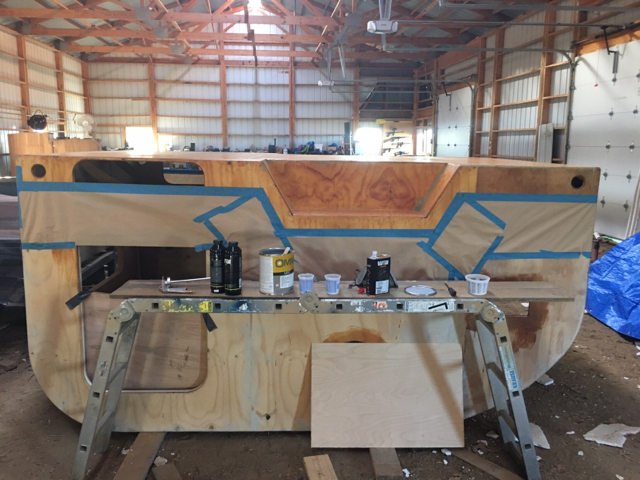 Question for the raptor liner users, are you laying down a layer of penetrating epoxy before spraying? I know you can spray directly but was curious if the epoxy was worth piece of mind. I had great results with Raptor over aluminum everything got sprayed first with Acid 8. I didn't need a high build epoxy primer. When I do my tongue box I am going to use epoxy over baltic birch then epoxy primer and finish with Raptor. The guy at the pint store is confident it's a good way to go. You can see the fine texture, the disk is an 80 grit. My texture is around 120 grit sandpaper. I used a cheap HF HVLP gun with 1.8 tip and had the pressure up near 50-60 psi. I did black and tintable. The first auto paint store was I went to and got the tint from was clueless, my Jeep's paint is a pearl. I gave them the code for the paint and since it is a pearl it is expensive and wouldn't tint the Raptor right. I ended up going off color chips and am close. The other paint store I have been going to said said you just add the tints and not any other fillers or binders to make paint. Then they add a few drops of white if needed. My neighbor said a co-worker of his just had his G Wagon done and it doesn't look nearly as good as my tear. I don't like the texture you get with the standard gun that comes with the kit. It's to rough for my liking. We'll see how well it holds up, but from what I have see and read it very good. Maybe I've been out of the loop for a while but it seems like you've got a lot of unique ideas. I'm interested in seeing the finished product. soapcreek wrote: Progress has been at a standstill while I’m acquiring the needed paint products. I picked up some por-15 for the frame and u-pol raptor liner has been on order for a few weeks. After Amazon bumped my delivery for third time I found another source and it should be here Friday. I have been using a 3.25oz tight weave and raka epoxy before I spray the raptor bed liner. My thought if it were to crack, branch scrapes a piece off, ect.. that would give me added protection. When I contacted U-POl they recommended at minimum to put a water sealer like Thompson's before spraying the bed liner. They also have an adhesion promoter I have been prepping it with before I spray the bed liner. Thanks for the follow up guys. I’m going to apply some TotalBoat penetrating epoxy before spraying the liner. I’ve read some good things about it. Time and use will ultimately tell if it was worth it. Something is better than nothing I’m sure. 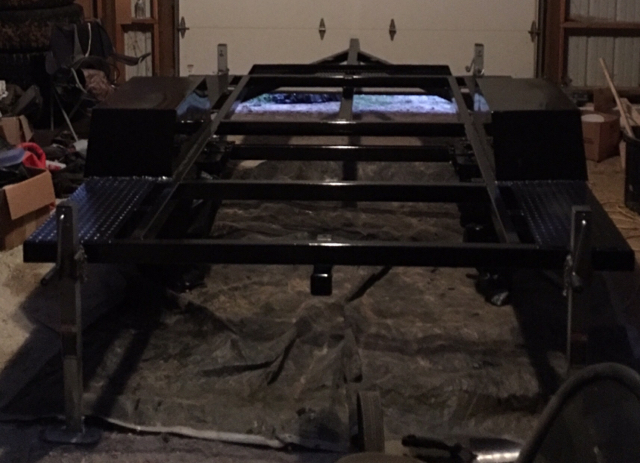 The plan is to get the trailer frame finished up over the long weekend. I’m also working on putting a make shift paint booth together out of plastic sheeting and pvc. On using the Thompson's for a water sealer, it's great for decks, privacy fences etc.. It does however leave an oily feel on the wood. I had some here at the house and thought "I have it, I'll just use it on the floor bottom of the tear, tried it on one small area and quit". 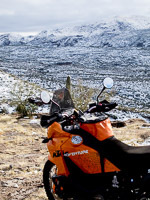 That little area I tried, I had to wash down with mineral spirits to get rid of the oily coating. Then I remembered when I did my gazebo deck, it took forever for it to soak in to the point it didn't feel oily. And some other products will not adhere to the Thompson's.. IMHO..
That stuff is paraffin dissolved in a solvent. I can't imagine it as a base coat for a bed liner material. 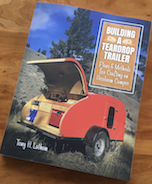 Challenger Door https://www.challengerdoor.com/teardrop-trailer-doors/ makes teardrop trailer doors in standard or custom sizes. Tony I can definitely see not using something that is paraffin based. Also like David mentioned about the oily coating as well. The U-POL representative from my area that I exchanged texts with said Thompson's and perhaps that is why they recommended the adhesion promoter as well. (I no longer have those texts so maybe it's possible he said something "like" Thompson's water sealer) I ended up using spar varnish, light sanding, adhesion promoter, then bed liner on the interior side of my flooring. 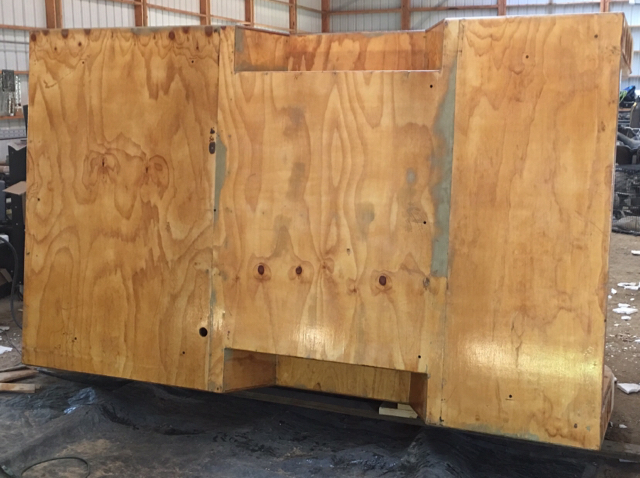 On the rest of the trailer (exterior) I used epoxy, sanded, adhesion promoter and then bed liner. Time will tell on the interior side if it peels or not. I just remember thinking I didn't want to spend money on water sealer when I had spar varnish already and since it was on the interior I wasn't super worried about it. The TotalBoat penetrating epoxy is great stuff to work with. It’s taking the full four days to cure coats in the cooler temperatures we’ve been seeing in Iowa. The Por15 has worked great also. It is still curing but looks like it will be a durable finish. A little goes a long way and goes on easily. Used just under a half gallon for two coats. You are going to top coat the POR 15, right? It will turn grey and chalky without a top coat. DaddyJeep wrote: You are going to top coat the POR 15, right? It will turn grey and chalky without a top coat. That is the plan. It will get a coat of implement paint. The side rails will get a coat of Raptor liner for added traction. 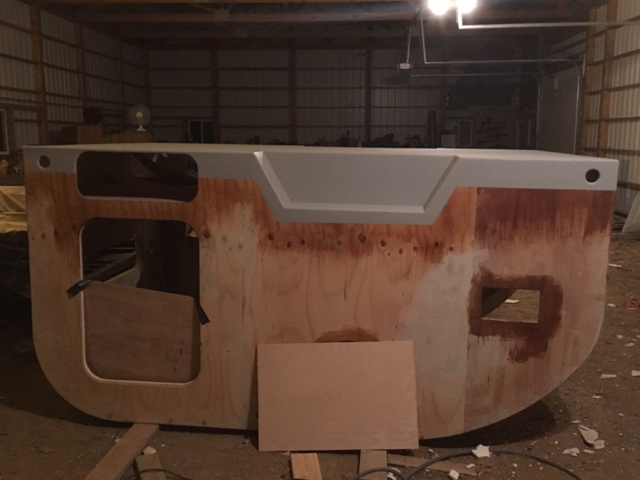 It finally warmed up enough in Iowa to be able to spray the bottom of the cabin with Raptor Liner. No pics but I’m happy with the color and it was easy to apply. After applying I was able to get a better sense of what imperfections it will and won’t cover up. That said I have a couple spots I plan to clean up a bit more on the side wall joins before finishing. 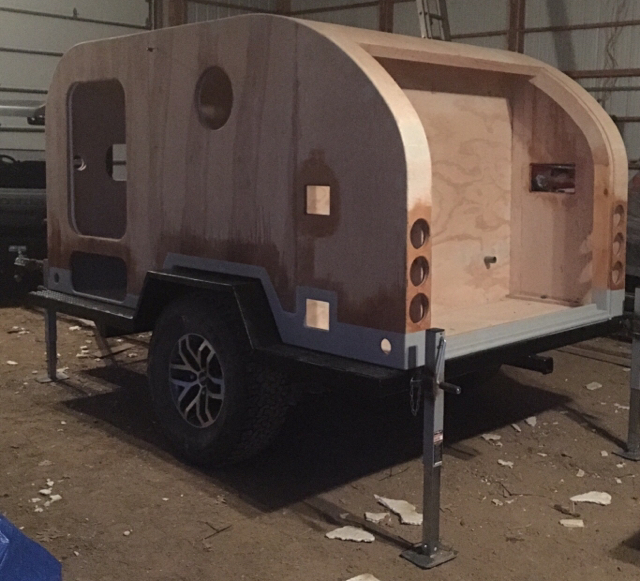 Just a couple photos of the bottom being finished. 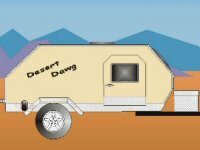 Trailer ready to receive the cabin. 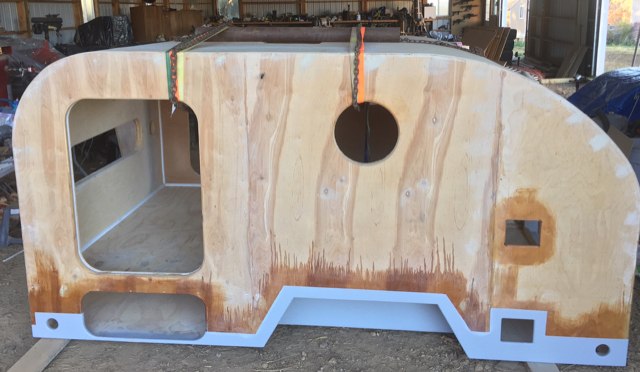 Applied some stripping where the cabin will contact the trailer. Cabin ready to be lifted. Ready to be bolted back together.